As anyone who’s been to Morgantown will tell you, Mountaineer Nation’s penchant for passionately celebrating our beloved football team is heads and shoulders above most college fan bases. 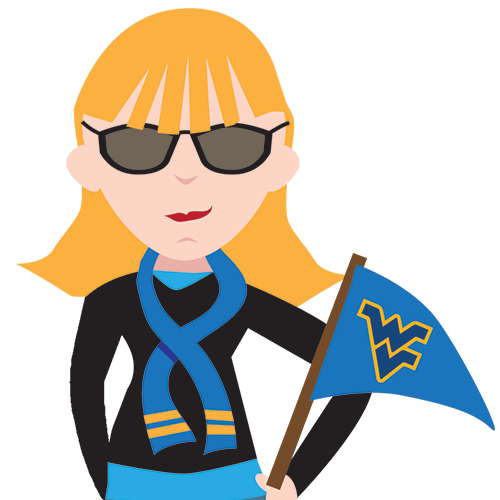 You see, Mountaineer fan spirit – much like West Virginia’s nature – can be larger than life. It’s why, after experiencing it, my friends from Ohio make it an annual tradition to come back for a game weekend. This past weekend, David and Jill Morgan came in. It’s also why I get contacted at least once a year by someone who’s planning a guys’ trip to Morgantown. These groups of guys travel to different cities for college sporting events, and naturally, Morgantown makes the list. They want to experience the Mountaineer Magic that’s tucked up and down these hills and mountains. Last year, Dan McGonigle and 7 friends from Philadelphia made their first trip to Morgantown to check out the game day atmosphere. This past weekend, Matt, a CFO from Long Island, NY, contacted me about coming to Morgantown with his friends Rob and Larry. Matt and his friends are college buddies from Binghamton University in New York. They love college football and go to a game every year. Larry, a guidance counselor in Rochester, was born and raised a fan of the Fighting Irish. Rob, now a judge in New Jersey, went to the University of Michigan Law School. Before Notre Dame backed out of the rivalry with Michigan 3 years ago, they went to every Michigan vs. Notre Dame game for 7 years straight. After the rivalry ended, they decided to go to other games in interesting towns. Matt’s nephew, Rob, also tagged along so he could see one of his friends, who’s a grad student at WVU. On the eve of game day, we met up with our friends, as well as Matt and his crew, at our favorite spot, Mario’s Fishbowl. Since it was homecoming, the Fishbowl was packed the whole day and well into the night. The crowd was loud and boisterous, giving folks who walked through the door a good ol’ Mario’s welcome with cheers and clapping. I’m glad that Matt and his friends got to experience the unique flavor and character of the place we refer to as the Center of the Universe. Of course, Matt cites the Fishbowl as one of their highlights. He even successfully tossed a quarter into the green glass that sits perched high above the bar. And for that, he got himself a free beer as this is no small feat. It was a banner fall morning on game day. When our Uber driver dropped David, Jill and me off at the gold lot at 8 a.m., Dave and our friend, Pat, had already been set up for a couple hours. The atmosphere was buzzing and humming with activity as truckloads of students and fans pulled into the lot. This game day also served as an unofficial parents’ weekend, as a lot of the families of our WVU kids traveled from near and far to the game. Although tailgating was cut short with a noon game time, we made the most of it. As game time rapidly approached, crowds flooded into the stadium to cheer on the Mountaineers. Unfortunately for the first 3 quarters, the game was about as much fun to watch as undergoing a root canal without Novacain. It was made worse by the sizzling heat. I swear my head was so hot you could’ve fried an egg on it. But then everything changed with a 2-point conversion in the 4th quarter. From that point on, our Mountaineers shut out the Red Raiders, scoring 22 consecutive points and beating Texas Tech, 46-35. Matt and his friends reveled in our favorite game day traditions, such as fans chanting “Let’s Go…Mountaineers!” so loud you can almost feel the stadium shimmy and shake. And of course, my favorite tradition, singing “Take Me Home, Country Roads” in the stadium after the win. Matt said he wants to retire in a college town and he views these trips as a way of finding the best one. Matt said it’s also the first football trip where he felt like they left a lot undone – which is one of the reasons he’ll be back next year. What can I say? The drama and seductiveness of game day in Morgantown pulls you in like a magnet draws iron. I happened to come across your blog when trying to figure out parking for the game against Texas. My husband and I have only attended 3 games but never have been able to tailgate as we are from out of state (husband is military but we are from southwestern PA) and we are always rushing to a game after visiting with family . I’m very thankful for your blog as now I know that I can try and park in gold lot. If you have any other tips please let me know!.